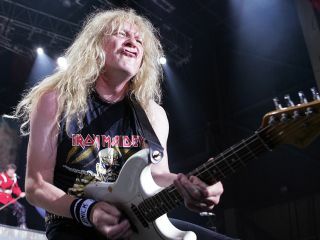 Iron Maiden guitarist Janick Gers says the band is "kind of intransigent. We never change. We know what we want. And it's in the music. We're never going to do a pop song, for instance. We're never going to do a song to try and get on the charts." According to Gers, who spoke with Pittsburgh's Post-Gazette, "We're just going to do what we think is right, and we did that through the '90s when grunge was popular and people wouldn't listen to rock anymore, and there were stations out there saying, 'We're not going to play any more rock 'n' roll.' We just kept on touring and stuck to our guns, and that's one of the reasons I think we're still around." As to how long Maiden would be 'around,' Gers says, "As long as we enjoy it and it feels valid and the fans are still coming and we have great concerts, I'd like to carry on. And the minute I don't enjoy it and we don't deliver, I wouldn't want to carry on as a parody act doing a cabaret show." On the band's current Final Frontier Tour, named after their upcoming album, Gers says that the group is only playing one new song, El Dorado, which has been released as a single. Playing any more than that is, in his words "impossible. Back in the early '80s you could probably do that, but now with YouTube and downloading, the songs would be all out before the album was out." Describing the longevity of Iron Maiden, Gers says it's all in the music: "It has to have a melody. Heavy music, I love it hard and I like that real powerful rock 'n' roll, but it has to have a melody, and if you lack melody, then you lose everything that it's about, and you play to a minority section of people. We play music that is very heavy but also has high and low points, and there are lots of melodies. We've got a great singer, an incredible singer, and we use him to his utmost. He sings his heart out every time we go out there." Gers promises that fans will get a full dose of all of those elements on The Final Frontier, which is filled with lengthy jams, most notably the 11-minute closer, When The Wild Wind Blows. "We're in progressive stage with the band now," the guitarist says. "We're taking it to extremes. The new album, I'm really proud of it, 'cause the one song we released isn't indicative of the rest of the album - there's so many different feels and ways of playing on the album. We go through some different attitudes and take you to different places. There's a lot of long thematic tunes on this album. And some very varied music."